Learn how to make a perfect pot of Basmati rice with each grain distinct and perfectly cooked – just like the ones served in Indian restaurants. Does cooking Basmati rice at home seem like a daunting task to you? No matter what you do, do you always end up with rice that is mushy and sticky? No worries, my friend. I will walk you through a step by step process to make Basmati rice at home and soon enough you be making perfectly cooked rice, every night. 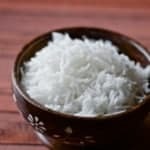 I will be sharing 3 different techniques to make Basmati Rice using a microwave, rice cooker, and on a stove top. But before we begin, I can’t wait to share this – did you know that there are more than 40,000 varieties of rice that are grown all over the world? I know! Crazy! 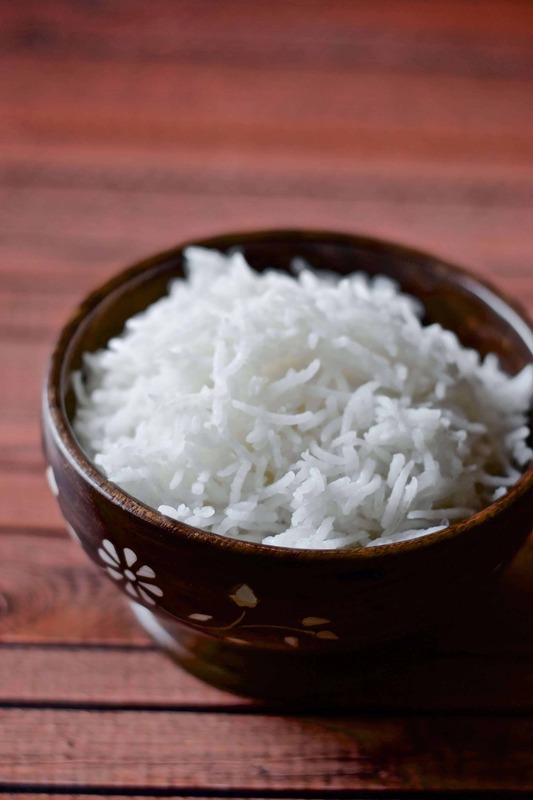 Though for today’s post, we are going to focus on Basmati rice – a variety of long-grained, aromatic rice that is primarily grown in the Indian subcontinent. It is also the one that is more commonly served in the Indian restaurants in the US. Buying the right kind of rice – Royal Basmati Rice is something we have been using for years and have always appreciated the consistent quality. There are plenty of other brands available but make sure to buy the Indian or Pakistani ones to get the authentic Basmati rice. Washing and soaking the rice – Make sure you wash the rice in a few changes of cold water to remove the extra starch and dirt. Getting the starch off makes it easier for your stomach to digest the rice. Also, soaking the rice makes it less brittle and also helps the rice elongate. Let the rice rest undisturbed for 10 minutes after it is cooked. This allows the steam to redistribute and all the layers of the rice are evenly cooked. After 10 minutes, uncover the saucepan and let the steam escape and partially cover the rice for another 15-20 minutes. This step removes the excess moisture from the rice and prevents the grain from being sticky. At this point, fluff the rice gently with a fork and it is ready to serve. Wash and soak – Add rice in a deep bowl and fill it with water till the rice is completely covered. Wash the rice by gently rubbing them with your fingers to dislodge any dirt and starch. Change the water couple of times till the water runs clear. Drain the water and add 2 cups of water to the rice. Let the rice soak for 30 minutes and proceed to cook in one of the ways mentioned below. Microwave – Place the washed and soaked rice in a microwaveable glass bowl in the microwave. Add 2 cups of water and stir in a pinch of salt and a tablespoon of ghee. Cook on the highest power setting for 30 minutes. When done, cover the glass bowl with a tight fitting lid and let the rice rest undisturbed for 10-15 minutes.Fluff the rice gently with a fork and it is ready to serve. Rice cooker – If you eat rice on a regular basis, I would probably suggest investing in a rice cooker. There are plenty of models to choose from ranging from $100+ (Zojirushi) to the relatively affordable Aroma series (which is what I have). Irrespective of which model you use, make sure to wash and soak the rice. As far as how to cook the rice in the cooker, you will need to follow the directions in the manual closely for best results. Stove Top – If you don’t want to make rice in a microwave or buy a rice cooker, we still have you covered. Check out the see the recipe below for cooking the rice on the stove top. Wash and soak the rice: Add rice to a medium-deep saucepan and fill it with water till the rice is completely covered. Wash the rice by gently rubbing them with your fingers to dislodge any dirt and starch. Change the water couple of times till the water runs clear. Drain the water and add 2 cups of water to the rice. Let the rice soak for 30 minutes. Cooking the rice: Place the saucepan with the rice on the gas over medium-high heat. Stir in the salt and ghee. In approximately 6-8 minutes, the water will start to boil and will start to evaporate from the surface. When craters will begin to appear, cover the saucepan with a tight-fitting lid and turn down the heat to the lowest setting and cook for another 5 minutes and turn off the heat. Resting the rice: Let the rice rest undisturbed for 10 minutes - this allows the steam to redistribute and all the layers of the rice are evenly cooked. After 10 minutes, uncover the saucepan and let the steam escape and partially cover the rice for another 15 -20 minutes. At this point, fluff the rice gently with a fork and it is ready to serve. That’s how we do it around here. Do you have a technique that has worked you? Please leave me a comment and let me know. Hey! thank you for sharing i will surely try this out.